Airbus Netherlands provides B2B information services about air quality based on data from different sources. Information about air quality helps policy makers to take the right decisions when it comes to cleaner air. The earth observation instrument OMI has been providing information since 2004. This is supplemented and enhanced from late 2017 onwards by the Tropomi instrument onboard the Sentinel-5 Precursor satellite. Tropomi makes a big step forward in the accuracy of the produced information; both spatial resolution (OMI: 13 km x 24 km, Tropomi 7 km x 7 km), and sensitivity have tremendously improved. The instrument is now able to observe smaller fluctuations and lower concentrations. This allows companies, governments, and citizens, to access accurate and timely information about air quality. Satellites have performed measurements of our atmosphere for years. 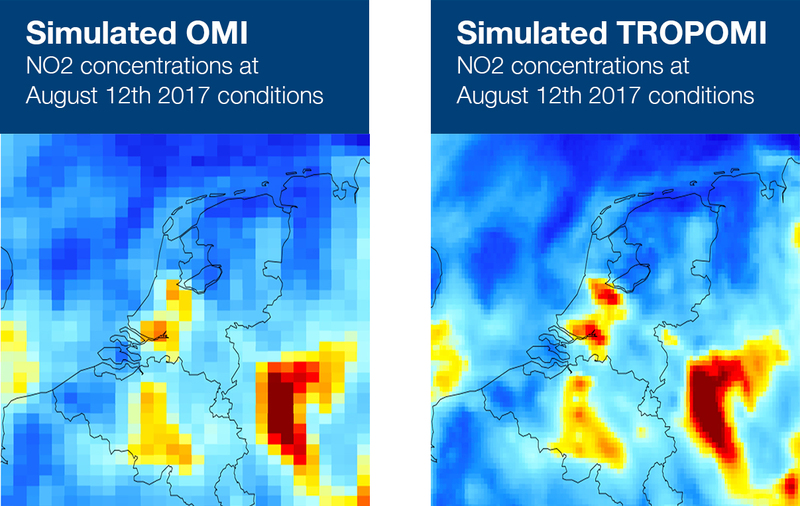 These indicate that air quality in Europe and the Unites States is improving. On the contrary, the air quality in Asia actually decreases. Information about air quality helps policy makers to take the right decisions when it comes to cleaner air. View this pop-up on a wider screen. View of the amount of NO2, measured by OMI on the NASA Aura Satellite. The amount of NO2 in the 10km high air column is a weekly average and is primarily determined by NO2 at the surface. 1 click → time series of the measured values of the selected location, indicating individual measurements, a long term average (2005-2016) per period and the trend for the selected period. No color visible? → with clouds, snow or ice OMI cannot measure NO2. No color in the Artic areas? → as it is dark in the North Pole area around December, OMI is not able to perform measurements. Around June, the same applies to the South Pole area.